The Quietus | News | LISTEN: Linda Sharrock Live At Le Guess Who? LISTEN: Linda Sharrock Live At Le Guess Who? In November last year, the wonderful Le Guess Who? 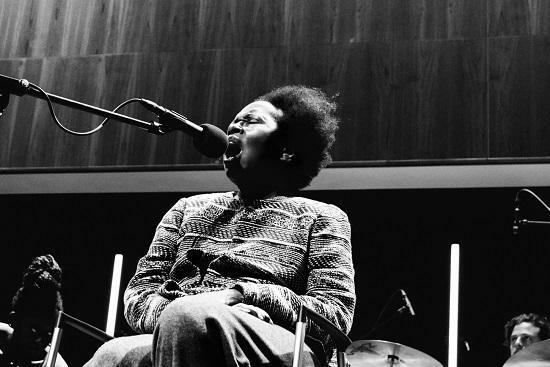 festival in Utrecht played host to, among many others, the legendary jazz singer Linda Sharrock. The recording of her phenomenal performance at the festival has just been made available, and can be listened to below. In 2009, Sharrock suffered a stroke which left her partially disabled and unable to speak, however managed to return to performing just a few years later, collaborating with Mario Rechtern and Margaret Unknown. Ahead of the performance last year, tQ's Stewart Smith spoke to Rechtern and Unknown, and provided this essential guide to the work of the prolific artist. To read our review of Le Guess Who? in full, click here.